After Grassroots Democracy Party (GDP) candidates for the upcoming commune elections took their seats inside the leafy grounds of the party headquarters in Phnom Penh for a pre-election congress on Thursday, they rose to their feet and bowed their heads in remembrance of their founding father: Kem Ley. The popular political analyst, who was gunned down on a sleepy Sunday morning in July while reading the morning newspapers at the convenience store of a gas station in the capital, founded the GDP in 2015 along with former civil society leaders including Yeng Virak and Yang Saing Koma. “Sometimes, it’s easier for us to explain to the people. When you talk about intra-party democracy, people say ‘Oh, OK,’” he said, impersonating a bored expression. In contrast, when it’s mentioned that Kem Ley was one of the GDP’s founding fathers, people’s faces often light up, he said. However, sitting in front of a huge painting of Kem Ley, Mr. Virak stressed that the GDP’s campaign strategy wasn’t a case of touting their late founder. “Some people say why don’t you call this party the Kem Ley Party, but you need to understand Kem Ley. He was not about promoting a person; it’s about promoting the party principles,” he said. True to its name, Mr. Virak says, rather than having a “cheerleader” at the helm, the GDP is seeking to create a more democratic local political system. Some of the party’s proposals at the local level include allowing each village within a commune to elect its own chief—keeping the current chief if popular within the community, regardless of party affiliation—and the establishment of a commune oversight committee to monitor elected officials. This comes alongside more general policies including upgrading local policing to stamp out drugs, developing dialogue with school teachers to ensure education is improved and having experts give advice to farmers on how to improve productivity. What sets the GDP apart from the ruling CPP and the main opposition CNRP is an emphasis on true democracy, Mr. Virak said. “The members have the highest authority. Before the election, after the election, they elect their party leaders so there’s no appointment. They are the ones who elect their representatives and the way we elect the positions is really in a transparent manner,” Mr. Virak said. Despite this, the party’s aspirations are modest for its first election, fielding candidates in just 27 communes in nine provinces out of the 1,646 communes across the country. Mr. Virak was optimistic that the party would win commune seats, but said a majority on the commune council in as many places as possible would be key to making a difference. Recognizing that their impact on these elections—both commune and national—will be minor, Mr. Virak sees it as a springboard for the party to wage a significant challenge by the 2022 commune elections and the national vote the year after. Political analyst Meas Nee, who was also involved in the formation of the party but stepped back around the same time as Kem Ley, believes that the party could strike a chord with voters in time. “I think they’re trying to generate a new way of applying democratic processes within the party and not looking to the party as the motive for voting, but looking at people. I think this is a model that a lot of Cambodian people could like,” he said, adding that the popularity of Kem Ley would only do the party favors. Sok Kea, 25, a student and member of the GDP’s youth wing who had traveled to the congress from Prey Veng province, said he had more faith in the party’s ideals in comparison to the CPP and CNRP, pointing to the large numbers of young people migrating in order to find work. “I joined the GDP because they want to strengthen the agriculture sector. I think the CPP and CNRP have failed to focus on agriculture,” he said. “Many migrants have left the country, especially to Korea. Some are going to Thailand to work in agriculture. Why can’t they find work here?” he asked. 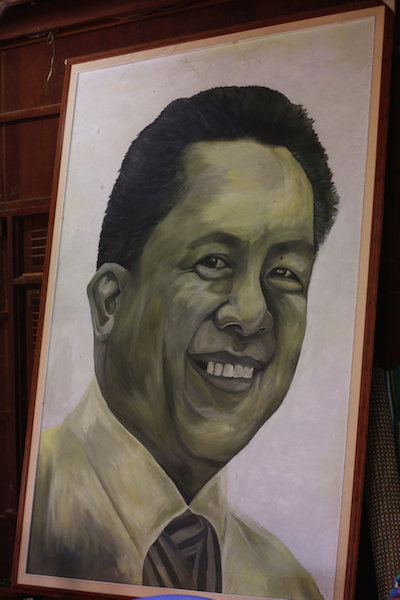 While he agreed that it was true the GDP’s image was helped by Kem Ley’s name, the student had faith in the current leadership to continue his legacy. 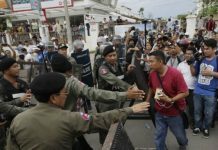 “The GDP will be popular because of its founder Kem Ley. But we have others like Yeng Virak and Yang Saing Koma that will ensure the party continues to grow well,” he said. It seems that Kem Ley and his legacy will, in some way, be forever entwined with the party that he helped found.